LASALLE INTERIOR TRIM are now able to offer high quality ALPINE Navigation products to be installed with our range of Land Rover Series/Defender Headliners. 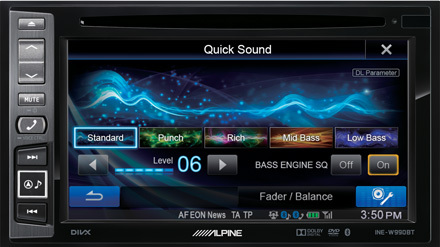 We believe that ALPINE offer the best sound for your listening enjoyment. 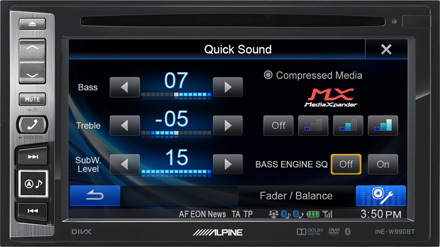 This ALPINE Advanced Navi Station is compatible with the DEFENDER DOUBLE DIN CONVERSION KIT. 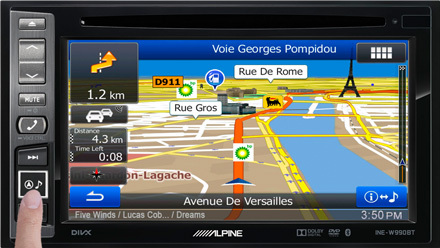 The INE-W990BT combines the best of Alpine’s new technologies for outstanding operation, guidance and safety. It features increased internal memory and CPU speed for smoother map scrolling and faster operation / route calculation. You get a wide variety of advanced tuning features, including the ability to use the versatile Alpine TuneIt App with Facebook linkage. Excellent sound quality complements its wide compatibility, including built-in Bluetooth with Voice Dial Function and optional DVB-T /DAB/DAB+. No matter what media you want to enjoy, the INE-W990BT is ready. It provides music and video playback from your iPhone/iPod, USB sticks and a DVD player (DVD-Video / CD / DivX / MP3 / WMA / AAC). If this ALPINE Navigation unit is purchased along side one or more of LASALLE INTERIOR TRIM products it will be dispatched at the same time as your Headlining/Side Trims/Door Trims. 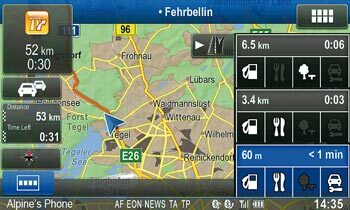 The INE-W990BT gives you wide map coverage of almost all European countries, support for maps with 3D landmarks, highway mode, advanced address input and other sophisticated features. No matter what media you want to enjoy, the INE-W990BT is ready. It provides music and video playback from your iPhone/iPod, USB sticks and a DVD player (DVD-Video / CD / DivX / MP3 / WMA / AAC). Videos look great on the 6.1” WVGA display with Visual EQ mode selection. You can also stream music via the built-in Bluetooth module. Sound customising functions include MediaXpander, 6-Channel Time Correction, Preset Equaliser (10 modes) and 9-band EQ. The INE-W990BT is compatible with the TUE-DAB1U (sold separately). Use the TUE-DAB1U DAB/DAB+ Receiver with direct touch control to add available stations to the unit’s internal station list. Use the Navi Station’s large display to operate your iPhone or iPod, with the advantage of Quick Search to find songs fast. And thanks to iPod Video Playback, you can also watch videos on the screen (requires KCU-461iV). 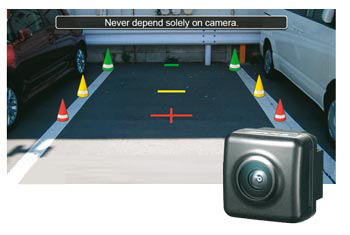 Adding an Alpine rear view camera makes reversing and parking much easier and safer. Coloured pylons appear on the screen as distance guides, and can be adjusted to match your car. 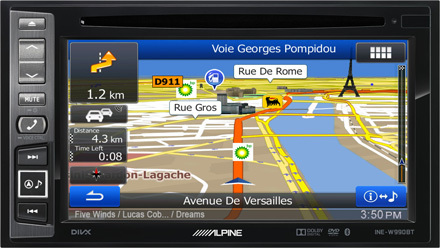 Alpine makes it easy to integrate the INE-W990BT with the factory system in your car. We have interfaces that let you operate functions via the steering wheel remote control and use a sub-display to view information from the head unit on the gauges. It’s all part of the security concept aimed at letting you keep your eyes on the road. You can display the currently playing information (radio frequency, track title, etc.) in the information bar of the navigation screen. You can simply switch between the navigation and audio playback mode with a single push of the main button. 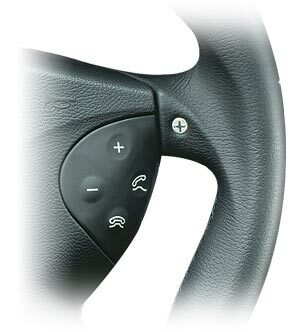 This is very useful especially on long drives when both navigation and entertainment are continuously used. The INE-W990BT puts the power of advanced sound processing in your car with BASS ENGINE SQ to maximise bass sound and overall tone balance, plus lots of custom tuning functions like Digital Time Correction and 9-Band Parametric EQ. Best of all, you can control them easily from your smartphone with the Alpine TuneIt App. 24-Bit DAC and 4-volt PreOuts, too! Download the Alpine TuneIt App, then connect your iPhone via USB or Android based smartphone via Bluetooth. Now you’re ready to use your phone as a handy interface to achieve exactly the sound you want in your car, including car and speaker / sub model selection. If you’re on Facebook, the app will also notify you of new messages on both your phone and the head unit. 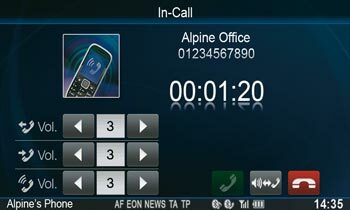 For more details, see the Alpine TuneIt App description in the Apps product category. You can pair a total of 3 phones with the INE-W990BT. You can even stream music from one phone while making handsfree calls with another at the same time. 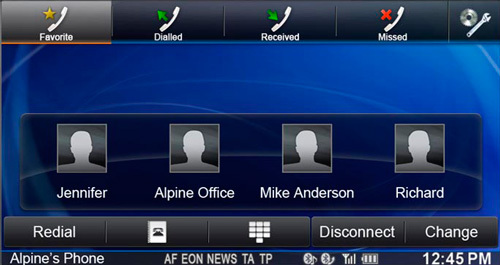 Set your 4 most frequent called numbers for easy access in the speed dial screen.